Do you want to make your outfits more creative or dramatic, or a combination of both? Blake Lively has what I'd describe as a Creative/Dramatic style (a touch of Relaxed, Feminine and Elegant Chic thrown in too). What does she wear and how does she put her style together? Let's break it down so you can steal some of Blake Lively's style tips. How do you layer your pieces? There are lots of ways to layer, but Blake Lively does it with flair and drama. Voluminous layers over each other, breaking the style "rules" of a slim garment with a voluminous one. Now, this only works when you're expressing a Creative/Dramatic personality, as they are the style rule breakers of the world. Notice though, even though Blake has a voluminous jacket over a voluminous skirt, that the jacket is cinched at the waist, drawing in the volume so it doesn't overwhelm her frame. And then the maxi dress is fitted through the torso so that the loose cardigan doesn't look out of place. Who are the pattern mixers of the world? The creatives! Blake does it in many of these examples. Some are more subtle and others are more Dramatic. For instance, the striped skirt with the patterned boots and the diamond bag above left, and the floral dress with the striped scarf and then the textured cardigan - all in the same colour palette, but different kinds of prints and textures thrown together. Then in this image below, the bold houndstooth with the striped jumper is another mix of patterns. If you want to learn how to mix patterns I've got lots of tips here - and if you like a stripe you're in luck, as it's one of the easiest patterns to mix with others (floral, animal, geometric, abstract), in fact, many consider a stripe to be almost like a solid! 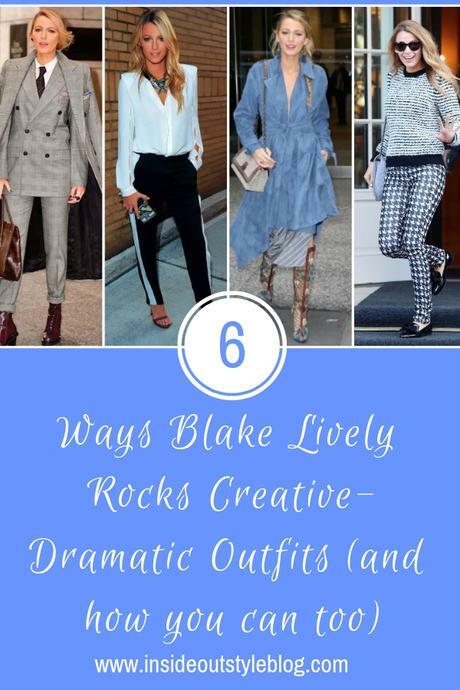 In many of these images, you'll notice that Blake is wearing a statement shoe. The finish may be patent and shiny, or the there an extreme heel or pointed toe, something about the shoe's construction and colour makes it a noticeable feature of her outfit and it leans into the dramatic personality dressing style. Take a classic suit, make it double-breasted, add a pocket square and a tie (above) and an overcoat all in matching tweed and you've got a Dramatic look, but then roll up the cuffs of the suit trousers to show off your oxblood shoes and you've added a creative twist. Why not add a shoulder pad to your Elegant Chic blouse - giving the shoulder a sharp, exaggerated, more dramatic line (below left). Add a wide high-contrast stripe to your tuxedo trousers to take them from Classic to Dramatic. 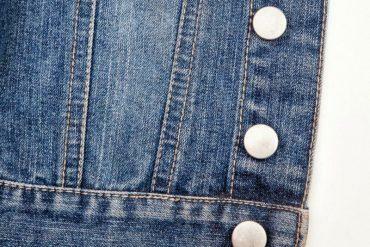 One of the keys to the Creative personality dressing style is unusual construction. Look for asymmetric details, like the zips on the boots (above right) and the skirt in the same outfit. Other little elements of unique construction to look out for are more subtle - such as the sleeves of the blouse (above right) and of the suit (below right). They move these garments out from being purely Elegant Chic into more creative territory. Blake is not scared of a non-traditional colour. 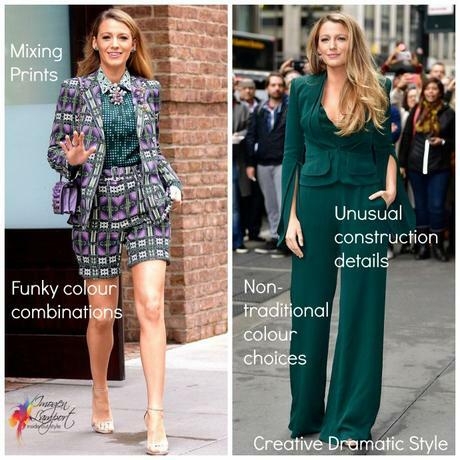 The purple and green short-suit combo - which includes not only this less than common colour combination - though one of my favourites - but also she's gone to expert status on the pattern mixing front - mixing three different patterns together in one outfit! A suit in a deep emerald green - not what you'd expect to find in your average office is another option to add in Creative-Dramatic elements to your style. Lastly, why not add a quirky statement accessory. The quirky brings in your creative side, the statement say I'm not scared of being seen or standing out from the crowd - a true Dramatic statement. The o verscale classic bag and the textured and patterned boots (top), the tie and pocket squares (2nd from top), the statement bird necklace (2nd from bottom), the brooch and necklace on multi-mixed-patterned short-suit (bottom). Too OTT? Not when you want to rock the Creative-Dramatic personality dressing styles together. For you, the style rules are meant to be broken as you're expressing your unique personality. Is this the Style Icon for You? Do you enjoy the Dramatic or Creative Dressing Styles? Are they for you? These two styles can be ones that scare some of us - they can feel "too much" very easily if they are not part of your authentic style. Maybe you like a hint of it but not the head-to-toe? How do you know how much of these styles to wear? If you're curious about this (and also want to know exactly which colours flatter you, and what styles of clothes make your body look its very best) - you can find all this out as part of my 7 Steps to Style program. It truly is the key to finding and developing your personal style in a way that both looks fabulous and makes you feel like the best version of you.